Each Chinese internet service visit duration ranking in 2012. Sina Weibo was ranked 3rd place. For each internet services, the number of users is naturally important, but the visit duration is also very important. 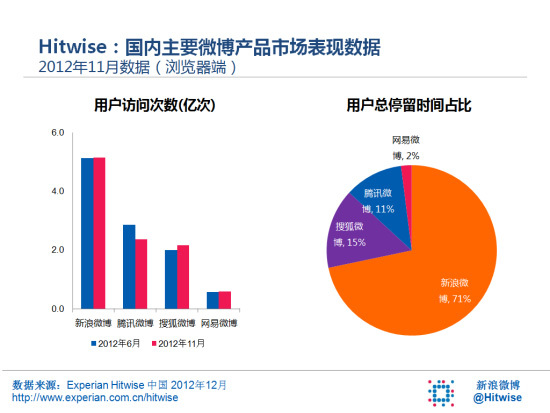 Meanwhile HTWISE just published the visit duration ranking of each internet services in China. In 2012, Chinese search engine giants Baidu was the 1st place of this ranking, and their 2 other services were also ranked in top 10. So it can be said that they are just the internet giants in China. 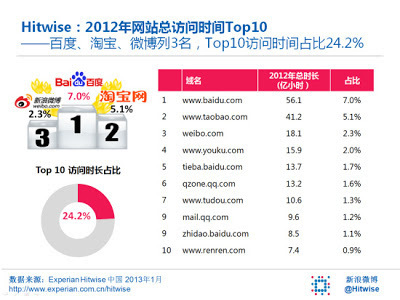 Chinese EC giants Taobao was the 2nd place. They have the top share of BtoC EC market in China, and its market is still rapidly growing, so it may be a natural consequence. Sina Weibo was ranked 3rd place, but there are little bit difference with top 2. Video sharing service "Youku" and "Tudou" merged last year, both were ranked in top 10. 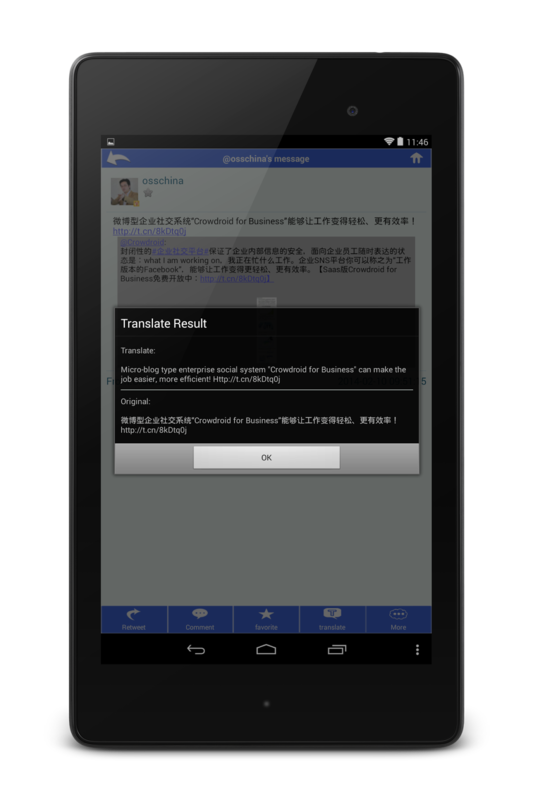 Next is the graph of focusing to Weibo services. The left graph is the number of visiting to each Weibo in annual of 2012. Sina Weibo was totally visited about 1 billion times in 2012. Tencent Weibo was visited about 0.5 billion times, and Sohu Weibo was visited about 0.4 billion times, and NetEase was visited 0.1 billion times in 2012. The right graph is the ratio of visit duration on each Weibo. Sina Weibo had 71% share in this, and it was a landslide victory. In 2012, Sina Weibo showed the overwhelming presence in Weibo market. But as I said, there are little bit difference with top two. Furthermore Weixin also exist their backward. 2013 is still challenging year for them.